A mumps outbreak in Washington has health officials concerned over how to keep the disease contained. The state reported on Wednesday that there have been 278 confirmed and probable cases of mumps across five different counties since October. Now, the Center for Disease Control and Prevention (CDC) is getting involved to help fight the spread of the contagious disease. Nationally, incidence of mumps has declined dramatically since the introduction of the US mumps vaccination program in the 1960s—before vaccines, there were about 186,000 cases of mumps reported each year, according to the CDC. In more recent history, the number of annual cases reported is typically well below 1,000 nationwide. But a few times in the past decade, there’s been a significant uptick in the annual number of mumps cases. For example, in 2006 the CDC reported more than 6,500 cases of mumps, which predominantly affected college-age students living in the midwest. In 2016, there were more than 5,000 reported cases nationally. The cause of the recent uptick remains unclear, although a 2010 study published in the Journal of Infectious Diseases cites a few possible factors, including changes in the efficacy of vaccines over time in populations, high population density in communal living situations, and individual immunity waning over time, even in people who have received the normal two doses of the measles, mumps and rubella (MMR) vaccine during childhood. Last month, the CDC reported that most individual state outbreaks of mumps have been occurring among vaccinated people, suggesting that a third booster of the vaccine might be needed. Another possibility is that not enough people are being vaccinated to maintain so-called herd immunity. As with other diseases that were once nearly eradicated by vaccines, the resurgence in mumps coincides with the birth of the anti-vaxxer movement. Unfortunately, that movement seems poised to live on under President Trump, who has tweeted about how vaccines may lead to autism, an idea that stems from a widely debunked, now-retracted study. There is ample evidence that vaccines do not cause autism, including a 2015 study of more than 95,000 children that found no association between the MMR vaccine and increased risk of autism. Whether or not Trump uses his position to stoke the flames of the anti-vaxxer movement, as some fear he will, the best way to combat the spread of mumps is to keep yourself and your children up on your vaccines. At the present, the CDC recommends that children get their first MMR vaccine at 12 to 15 months of age, and again at age 4 to 6. Parents and doctors should watch out for symptoms, which include swollen salivary glands under the ears on one or both sides, fever, headache, muscle aches, tiredness, and loss of appetite. These symptoms typically appear about 16 days after infection. Most people recover within a few weeks, though some can experience complications such as hearing loss and inflammation of the brain. 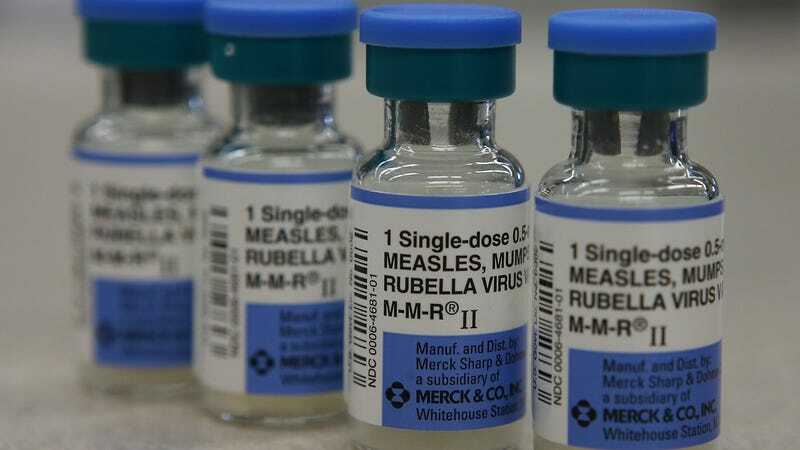 For now, Washington state is supplying the MMR vaccine to local health departments to ensure that there’s enough for people who want (or need) it. The state is also working with local health departments to track how the outbreak is spreading.